I've yammered on at length in this space about how I get completely unnerved, irritated, flabbergasted by the lack of kids (for the most part) playing freely out on the street. You know, with their friends, til the street lights come on — uninhibited, running, playing, exploring, freely. 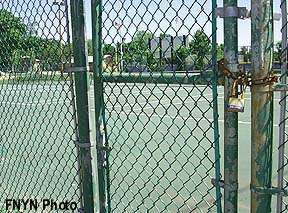 Another source of consternation for yours truly which has also been documented in previous posts is how many sports that used to be so easy to access when I was a kid — tennis, basketball come to mind — are now victims of bureaucracy, vandalism, fear and a host of other silly reasons. So now in many areas you get back-boards with no rims so no basketball or locks on the gates of empty tennis courts or my personal favourite boards but no ice on an outdoor shinny/hockey/skating rink. Since moving to a new neighbourhood a few months ago, we noticed that again there were not many kids playing on the street. We know there are tons of kids around here — they all found a way to come out on Halloween. Twice this week alone kids we don't know have been playing basketball in front of our house, using 'our' net. Young, old, teens and beyond. Once we arrived home to find a group of kids playing. Then the second time we were in the process of leaving our house to find strangers dribbiing around our driveway. We smiled and waved as we backed the car out at these strangers, and new acquaintances. Our kids have been mesmerized. They are encouraged to play outside every single day and so welcome the idea of making new friends while playing sports. The neighbourhood kids are also somewhat shocked. That they'd be allowed to use a strangers' stuff. It all makes perfect sense to me. Kids and play go hand in hand. We've made it so darn complicated and then wonder why obesity rates are skyrocketing, why kids are fixated on electronics, and on and on. It's really not brain surgery, is it?